These throat drops have been helping people feel better for over a century now and are really helpful when your throat is feeling a little scratchy. I know from when I lived in the midwest that the flu bug and cold's run rampant and that a sore throat is just part of the cold, surprisingly this year I didn't suffer through a seriously sore throat but these helped me out during class presentations to sooth an itch. obviously texture is a personal preference and just because I didn't LOVE the "softish" part of them doesn't mean you won't... I'm weird, I don't much care for gum either. 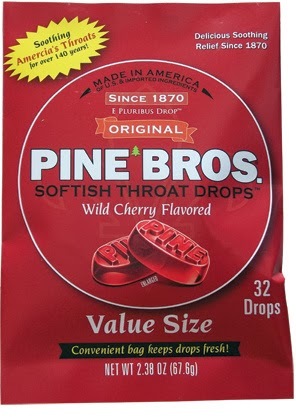 I was given the opportunity to review their Wild Cherry Flavor softish drops and the flavor wasn't the most delicious thing I've ever tried but definitely much better than a standard cough drop. These almost taste like candy so I'm certain little one's would be more than happy to pop one while feeling a bit down on their weather. If you are looking for a quick fix for a scratchy throat, then these guys will do. I think they would be a decent addition to a "get-well-soon" gift box as well. They aren't going to cure your illness but they will soothe your throat, which means a lot to someone who is feeling sickly. I only recommend products or services I use personally and believe will be good for my readers.